With the unofficial start of summer here, it is time to start thinking about how to keep our skin safe when out and about in the sun. Although it is recommended to wear an SPF year round, we start thinking about it now that we are spending more time outside, gardening, cooking out, relaxing, and going on vacation. The best way to protect ourselves from the sun is to cover up, wear a big hat and sunglasses, finding shade, and using a beach tent if you are planning on being in the sun for extended periods of time. Unfortunately, that is not always possible, so I have put together some facts and resources on staying sun safe with sunscreen! You may be wondering which sunscreens are the best. To be honest, I don’t have a perfect answer, but I can help guide you to find a sunscreen that can best fit your needs. As we are becoming more aware of the toxins in mass produced skincare products, I find myself choosing physical sunscreens over chemical sunscreens. Physical sunscreens are a good option for those of us who may have skin that is sensitive/sensitized, acneic, or is experiencing any other skin conditions. There are two types of sunscreen’s, physical and chemical. The packaging may not label your sunscreen as such, so it is always a good idea to know what to look for in the ingredients. These ingredients are also good to know when looking for something like a daily moisturizer with an SPF. A physical sunscreen’s active ingredients will include titanium dioxide, and/or zinc oxide. These are mineral based ingredients that will reflect or scatter some of the UV rays. A chemical sunscreen’s active ingredients oxybenzone, octinoxate, octisalate and avobenzone. These active ingredients are organic (carbon-based) and will absorb the UV rays, turning them into heat and then releasing from the skin. Remember regardless of which type of sunscreen you choose, you always want to make sure to apply at least 30 minutes prior to sun exposure, and to reapply as stated in the FDA’s guidelines. This can be a feat for those of us that wear makeup or find it messy to keep reapplying a lotion through the day. There are alternatives, such as mineral sunscreen that you can brush on throughout the day like a setting powder. They even come with a cover and a built in brush for easy portability. Shopping for sunscreen can also be a daunting task, as it can be overwhelming standing in that aisle. Lotion, spray on, or stick, different strengths, and brands, how do we know which are tried and tested? Every year the EWG (Environmental Working Group) publishes a Guide to Sunscreen. They go more in-depth and rate the best and worst brands of sunscreens, according to their research. This is a great resource to check the score of your sunscreen or to find one if you don’t already have a preference. In my personal circle of friends and on social media I have noticed an increased interest in skin health. Using a daily sunscreen can help you maintain healthy skin, and slow down extrinsic aging. Once we are into adulthood, it is never too early to start preventative anti-aging. Using sunscreen daily can be an easy, quick, and vital role to your daily routine. If that sun kissed glow is what you absolutely desire, you can always opt for a sunless spray tan. Plus you can always choose to skip the tan lines when you go sunless! 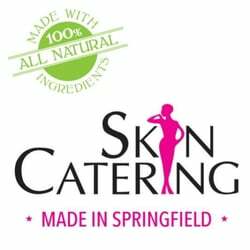 Skincatering offers sunless tanning by appointment in their Springfield location. Although sunless spray tanning does not offer any UV protection, it does give you a healthy natural looking glow without the effects of long term UV exposure. In the summer I am out and about much more than I am in the cold winter. The season starts with graduation parties, progresses to birthday parties, cookouts, pool parties, and ends with labor day parties. In between all that we are going to the beach, and planning summer activities with our family to make the most of the summer months. There are times in the midst of all these activities and parties that I sit down and realize I have been going non-stop for days and then I realize, it is time for a self-care day. We all need to make time for them, no matter how many things we have planned in our calendar, taking time out for yourself is vital. Since we are smack in the middle of summer, I thought I would give a few tips for self-care that you can always make time for. Hydrate yourself. I know I talk about hydration in almost all my posts, but I keep it up because it is so important. Water is essential to keep our bodies running, so staying hydrated is something we should stay conscious about. How much water should we drink each day? The old adage is 8 cups of water per day to stay hydrated, while a good general rule of thumb you may need more than this when you are spending more time outside in the heat or exercising. If you have a hard time remembering to drink water through the day or maybe water just doesn’t suit your fancy, there are ways to remind yourself or make your water more palatable. These are all to personal preference but you could add it into your daily planner or journal, get an app that reminds you to drink water through the day, keep a big water bottle with you at all times. To make your water more fun or interesting, there are so many ways to infuse water with fruit to help you enjoy it more, of course, the one that comes to mind is lemon water because it is so common, but if you go onto Pinterest and search fruit water, you will get more ideas than you ever imagined! Wear your sunscreen every day. Even if you feel as though you won’t be outside (unless you are actually staying in all day) you will likely be exposed to the sun on your commute or getting from A to B. Even just wearing a good broad spectrum mineral based sunscreen on your face and decolletage will help guard you from the suns rays, that over time can break down collagen and elastin and increase your risk of health issues related to sun damage. If you will be out at the beach, or in the sun more than from home to work, find a good sunscreen that will help protect you while enjoying the summer weather. Take some time out of your busy schedule to relax. Book a one hour massage or custom facial. There are more benefits to massage and facials than you may realize. Yes, they are wonderful to wind down and relax, but here are some massage benefits you may not have known. Our facials at SkinCatering are more than just relaxing, we customize our facial to your skin type and your greatest concerns so that we can work together to help provide you with relaxation and results. Our Esthetician Holly is also a Certified Reiki Practitioner and offers Headache Relief Massage Reiki sessions and Custom Facials with Reiki which is the ultimate in self-care! We offer massage and facial services in Springfield and Holyoke, and Holly offers Reiki services in our Holyoke location. My last tip, take a breath and enjoy life. Sometimes when we are caught up in the hustle and bustle of life we forget to take a minute to stop and breathe. Whatever it takes for you to take a moment for yourself is up to you. Some prefer to meditate, some just like to sit and relax by the pool, while others may want to join in on a yoga class. When it comes to self-care, even just taking a few minutes a day to clear our mind and relax can yield significant outcomes in our well-being.